Indicleft is a new tool to monitor clinical profile and the treatment status of cleft lip and palate subjects in India. The new tool has been developed by various research institutes including AIIMS and ICMR under the Indicleft Taskforce project. The hospital-based pre-pilot study was initiated under the aegis of Indian Council of Medical Research (ICMR), New Delhi in 2010. The study was advanced and successfully completed in the Department of Orthodontics & Dentofacial Deformities and ENT, AIIMS, New Delhi (2010-12). protocols of treatment given to these children and their actual treatment needs. A total of 164 cases with cleft lip and palate anomaly were recorded from three hospitals involved in the project (55 from AIIMS, 54 from Safdarjung, 55 from Medanta- The MEDICITY). A significant percentage of cases required lip and nose revision surgeries (36% and 35% respectively). Fifty-five percent of cases had a post-surgical oronasal fistula. A large proportion (77.5%) of the operated UCLP cases had complex orthodontic treatment needs. A high proportion of patients had hearing defects (44.7%) and many of these also had concomitant tympanic membrane afflictions also (nearly 40 % cases), in one or both the ears. Around fifty percent (49.7%) cases had clinically relevant speech intelligibility problems. The results of the study indicated that in the sample of cleft patients assessed in the project, the treatment needs were high. There seemed an urgent need to devise strategies to improve the delivery of quality care with joint efforts of all experts and health care providers. Cleft is a congenital facial deformation characterized by a complete or partial cleft of the lip/the palate. As a baby develops during pregnancy, body tissue and special cells from each side of the head grow toward the center of the face and join together to make the face. This joining of tissue forms the facial features, like the lips and mouth. 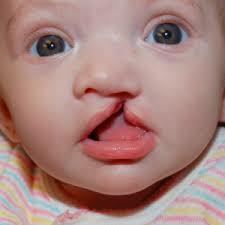 A cleft lip happens if the tissue that makes up the lip does not join completely before birth. This results in an opening in the upper lip. The opening in the lip can be a small slit or it can be a large opening that goes through the lip into the nose. A cleft lip can be on one or both sides of the lip or in the middle of the lip, which occurs very rarely. According to a report published by ICMR, Delhi, cleft lip and palate anomaly constitutes nearly one-third of all congenital malformations of the craniofacial region with an average worldwide incidence of 1 in 700. The number of cleft lip cases in Asia has bee estimated to be around 2.0 per 1000 live births or higher. In India, although a national epidemiological data is not available, many studies from different parts of the country have reported variation in the cases of cleft lip. Sidhu and Deshmukh reported the incidence of Cleft Lip and Palate (CL+P) at AIIMS, New Delhi to be 1.4 per 1000 live births. Mossey and Little estimated from various multicentric studies across India that the incidence of CLP in India ranges from around 0.93-1.3 for cleft lip and palate.